As a child what were your early influences towards cinema? Art, literature, graphics, music, photography? Growing up, my father was my biggest influence towards music and cinema. We were the one of the first people in our society to get a vcr and that is when my love for films started! Every weekend was a trip to the video store to rent 2-3 films and watch them all in one sitting. I remember the first film we saw when we got the vcr was The Wall by Pink Floyd. Not many kids my age got to see that! My love for music helped there. My father is a big audiophile and so are most of his friends. One of his friends had this huge Bose system with a CD player(in 1985!) and I would go to his house every evening to listen to music. Loved the sounds that came out of the system. Being exposed to good sound from a young age really helped me train my ears. You know what the result should be, even when you are starting out, and you try and work towards that goal. I really became serious about audiography when I was doing my bachelors in electronics engineering. It just started with DJing for friends’ parties. Then I got hold of audio software and the tinkerer in me took over. The biggest favour you can do yourself as a sound engineer is to listen.. And listen all the while. For me it is like being a character actor. Im a sound engineer every moment of the day, whether it be listening to music, watching a film or just out for a walk on the beach. Also, I never compromised on sound quality. Almost everything I earned in the first few years, I spent on buying speakers, headphones and other associated equipment. Speakers and headphones are the lenses into the world of sound so its always good to get the best you can afford. 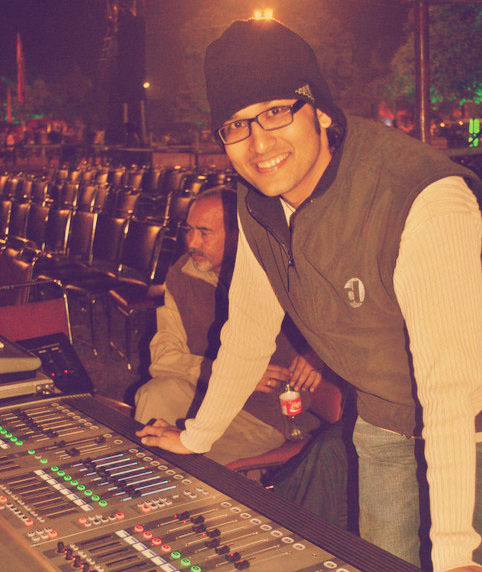 When I was about to finish my diploma, I got a call from KJ Singh, a very highly regarded sound engineer and IMHO one of the very best. I had called him before for a workshop so I knew him from then. His only question was, “Are you free the next three weeks?”. That was an offer you cannot refuse! It turned out he needed someone to assist on the song mixes of the film Udaan. I had never mixed a commercial song before so it was a huge learning curve. Just working on material like that for a first project was a huge confidence booster for me. I would line up the tracks and get a basic mix going. KJ would drop in every once in a while and tweak things to his satisfaction. That was a treat to watch, since I had worked on those very tracks, I could see exactly where I had gone wrong and where I’d done the right thing. By film, if you mean mixing music for film, look above! The first commercial film project that I worked on was the Kamal Hassan film Udaan. I met the Supervising Sound Editor for the film through a common friend. He was looking for someone to do the dialogue edit for the film. It turned out, they were also speaking to KJ Singh for the sound design of the film. So I got roped in from both sides! Again, being one of my first commercial projects, it was a massive learning curve in terms of managing the huge sessions for a film that incorporated Hollywood scale action! Just the Dialogue, Ambience and FX sessions went well over 200 tracks and we were running multiple protools rigs to get everything up and running. The music was pre-mixed and the stems incorporated in the sessions. All the sound design and edits were done at Modi Digital in Andheri. Fortunately, time was not an issue and we could take a good month to complete the sound design for the film. After that, we moved everything to AM Studio in Chennai for the final mix. The edit for the film was still changing so it was quite the roller coaster ride to incorporate the new edits and at the same time continue working on the film. At the end of the day we were all very happy with the result though. Is Sound Design intuitive or is it something you learn? I believe, Sound as a whole, whether it be Sound Design for film or mixing music has to come from within. It can be learnt to a certain extent but intuition plays a big role in what you give creatively as an artist. It comes from the heart. Your favorite films or audiographers? At least two of them? I have always been around music and expensive audio systems. My father and most of his friends are big audiophiles so that had a huge impact on how I referenced sound as a whole from a very young age. The first concert that I ever attended was Remo Fernandes Live. Just seeing the energy in the audience and watching the engineers go about their job, I knew what I wanted to do for the rest of my life! I started out when one of my seniors from FTII, Anmol Bhave, wanted to work on a concept show that he had in mind. We had some chai at good-luck and figured we were going to mix the show ourselves. Later, the vendor who provided sound for the show said he was looking for someone to work on concerts. That was my first official gig! I would finish classes in FTII and then head to the venue in the evening for sound-check. The gigs would usually get over by about 11. Then pack up the speakers and the console(I had to help cart away everything), pack up a nice dinner somewhere and head home. I was hard work, but I was having a bloody good time! The wish list never ends! But its getting better all the time. When it comes to live sound, it can be quite challenging to get the right equipment as there are so many pieces of gear involved. But travelling with a known band makes all the difference in the world and vendors pretty much manage to pull it off even in the smaller towns. A couple of short films, a feature length docu, two albums and a lot of gigs! Any advice to the inspiring audiographers? Tons of them.. It would take another few pages to list them though! Maybe another ‘blunder only’ special! Sound design for a hollywood blockbuster? Would love that! Mixing an arena gig with 100,000 in the crowd! I will be appearing for the FTII entrance exam, for the Sound Design course. I am searching for some previous year question papers. Anywhere I can find them?